Luc Vantomme is the Chief Commercial Officer for APAC managing the team of Sales and Customer servicing teams across different offices in the region (Tokyo, Singapore, Hong Kong and Beijing). Before that, Luc was Regional Head for Europe in the Euroclear Group Sales and Relationship Management division. Previously, he occupied positions as Global Head of Innovation and Chief Risk & Compliance Officer for the Euroclear Group. 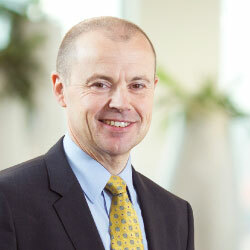 Before, Luc was head of Euroclear Bank’s Network Management and Banking division. He was also responsible for all operations relating to investment funds at Euroclear Bank. Prior to joining Euroclear in 1993, Luc spent six years working as a sales manager for IBM. Luc holds a Bachelor’s degree in Commercial Engineering from the Katholieke Universiteit Leuven (Belgium) and took part in the J.P. Morgan Financial Programme in New York in 1997. The banking industry is at a crossroads. For all the recovery since the 2008 crisis, there has not been a return to ‘business as usual’.